June 2011 by Organic Research Center. Protective afforestation in Ukraine has a long history and a rich tradition. Ukraine has a unique heritage of traditional windbreaks systems with a high environmental, economic and cultural potential. Ukraine is a motherland of protective afforestation and windbreaks systems with it more than 200 years history. First contribution to the development of afforestation did V. Lomykovskyy (Gladun 2007). For the 1809-1837 he developed a system of protective forest plantations within that the territory of his estate in Poltava province. He created different types of protective plantations: windbreaks system at arable land; massive afforestation of the land unsuitable for agriculture; linear stands along roads, around gardens, settlements and other objects. As a result of these measures the yield of crops in the fields has been increased and become stable in comparison with yields of his neighboring landowners. The steppe afforestation became fulfillment at planning base at national scale at the second half of the nineteenth century (Gladun, Lokhmatov. 2007). Since the early 30th last century windbreaks was carried out on a regular basis by the state, regional and local projects (Bodrov 1974, Pylypenko. 2004). The area of the country is 60.3 million hectares. According to the official data of 2016 agricultural lands in Ukraine share 70,8% of total area, including 53,9% of arable lands and forest lands occupy about 17,6%. So Ukraine is a large agrarian country, where arable lands occupied 42 million ha or 71% of the territory. In recent years, the climate has changed to a hotter and temperature trend going north and west. The total area of windbreaks is about 446 thousands ha and windbreaks cover is about 1,4% of arable land, that is double less then optimal index (Table 1). They protect 13 million hectares of arable land and agricultural landscapes. Ukraine has all necessary conditions for developing agroforestry systems with high ecological and economical potential of windbreaks. About 85% of the territory might be involved for sustainable agroforestry use. Windbreaks as the main biological element of typical Ukrainian agroforestry systems have multifunctional use that provides economic and ecological benefits. Economically windbreaks due to their positive effect on microclimate of agricultural field, increase yield of agricultural crops on 10-20% and with selective felling provide firewood. According to sustainable needs windbreaks can give economic and ecological benefits to organic farmlands (fig. 1). Ecologically windbreaks provide much more benefits: increasing of organic environmental friendly production, improvement of soil fertility, climate changes mitigation, ecological corridors for ecological networks. The windbreaks producing the highest ecologic and economic efficiency have to consist of autochthonous species: Quercus robur, Fraxinus excelsior, Tilia cordata, Acer platanoides, Corylus avellana, Sambucus nigra, Ribes aureum. The composition is available to form dense, sieve-looked and blown designs. The typical windbreak usually consists of 3-5-rows with total width 7.5-15.0 m. The seats placement for the typical scheme of the windbreak is 2.5-3.0 m between rows and 0.5x0.75 m spaces in lines. Windbreaks as an integral part of organic farming. Unique organic agriculture farm “Agroecology”, which has been functioning since 39 years ago on the area of about 8 000 ha in Poltava region. Enterprise is certified as a manufacturer of organic crop production, according to standard which is equivalent to Council Regulation of the European Union. This enterprise doesn’t use herbicides, pesticides, fertilizers, but uses manure, rotation of agricultural crops and every fourth yield leaves on the field and thus providing high-quality environmentally friendly products. Using of fruit trees in composition of windbreaks provides fruit growing products and additionally fodder for fauna. Also windbreaks as a linear forest stand provide a lot of ecological benefits in increasing of biodiversity, improvement of soil fertility, suitability of landscapes and of course can provide wood for example for heating. Those aspects are useful for promotion of silvoarable agroforestry in Ukraine. Similar practice could be realized in Ukraine for silvopasture agroforestry with pasture protective lineal stands. The next element of agroforestry in Ukraine is the water regulation shelterbelts which are located at the slopes from 30 till 90 by contours (horizontally) (fig. 2). Water regulation shelterbelts fulfil the dual functions: transfer of surface runoff to underground and soil protection from wind erosion. NGO “Ukrainian Agroforestry Association” conducts public work on maintenance and development of Agroforestry. It was established in 2016 and registered with the Ministry of Justice of Ukraine. The association is guided by its statute and work plan, which is being developed annually. The main objective of the association is to disseminate the practice of creating, cultivating and maintaining a farm in agroforestry plantations (windbreaks, water regulation shelterbelts, pasture protection plants, plantations of linear and curtain types, etc.) on agricultural land. to develop and implement various projects on the implementation and development of Agroforestry in Ukraine. The association includes 18 members from the areas: Kyiv - 6; Bila Tserkva (Kyiv region) - 3; Lysyanka (Cherkasy region) - 2; Berezno (Rivno region) - 1; Kharkiv - 3; Novgorod-Siversk (Chernigov region) - 3; Uman (Cherkasy region) - 2; Sambir (Lviv region) - 1. There are some pictures characterizing the research activity. The Association is the organizer of seminars, workshops, exhibitions. Members of the Association regularly participate in national and international conferences, scientific schools, round tables, which promote the development of Agroforestry in Ukraine and research in this field. 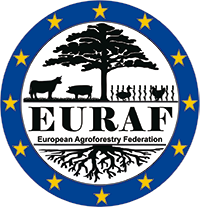 NGO “Urhfinian Agroforestry Association” closely cooperates with the NGO “Association of agroecologists of Ukraine”, the Communal Enterprise “Agroforester of Bilotserkivshchyna”, National Ecological Centre, research institutes, higher educational institutions, environmental organizations. Association cooperates with related to Agroforestry departments of universities Ukraine (National Forestry University of Ukraine (Lviv), Ukrainian Research Institute of Forestry and agroforestry (Kharkiv), Ukrainian Scientific Research Institute of Mountain Forestry (Ivano-Frankivsk), Institute of Agroecology and Environmental NAAS of Ukraine (Kyiv)) and colleagues from foreign partner institutions (Bureau of forestry seed Poland, Berlin University. Humboldt, Russian national agroforestry melioration institute (Russia), International Institute for Applied Systems Analysis (Austria)), scientists SE «Kiev Forest research station», employees «Ukrdiprolis», «Ukrderzhlisproekt»”, Scientific information center of forest management, the State Organization «Ukrainian forest selection center», scientific-pedagogical staff of colleges, leaders and specialists advanced state forestry enterprises («Teterevsky FE», «Uman FE», «Radomyshl FHE», «Fastiv FE» «Gorodnyanskaya FE») and the forest park enterprises in. Kyiv («Darnytskyi FPE», «Svyatoshyn FPE» and «FPE Concha Zaspa»), farmers, etc. Over the past two years, activities have been carried out to build the Association, attracting additional individual and collective members. At the beginning of 2018, the number of regional centers was set at 7, the number of individual members was 54, and the number of collective members was 6.
expert meeting on the coordination, formation and development of a national system for monitoring natural resources and inventory of forest bands (under the auspices of FAO, 18.10.2019). study of foreign experience in solving agroforestry problems, state policy in this area, creation of conditions for its introduction in Ukraine. organization and participation at the conferences, round tables, seminars etc. The website of Agroforestry Association is under reconstruction now. The information will be submitted in soon. But now we could use the website of National University of Life and Environmental Scienses of Ukraine and the page of the Forests Restoration and Melioration Department. Members of the association are constantly conducting research in a unique object of forest melioration - Dokuchaevsky windbreaks at Kropyvnytskyi region. There are grown 4 windbreaks of 121-124 years old. A brief history. The expedition of Professor Vasyl Dokuchaev scientifically substantiated the expediency of forest melioration in general and field protection in particular. A “Special expedition” was organized on May 22, 1892, after catastrophic drought and dust storms of 1890-1891 and lasted until 1899. Together with other tasks of the scientific nature, the expedition foresaw research on forest-melioration: the creation of protective forest plantations in the Steppe along the watersheds, passes and most open areas in the form of forest strips of different widths using different tree and shrub species; afforestation of ravines and river banks; creation of protective forest plantations on dry and dehydrated beams and around the ponds in order to improve their hydrological regime. To accomplish the tasks of the expedition, V. Dokuchaev created a network of special experimental farms. These experimental sites are located in a high Steppe in the watersheds of the Volga and Don rivers, Donets and Dnieper, Don and Donets. The expedition carried out unique scientific research, which became the basis for the scientific substantiation of the systemic solution to the problem of combating adverse natural phenomena: droughts, drylands, dust storms, and water and wind erosion of the soil, which are very relevant today. The main role in this complex is devoted to protective forest development, the development of which is marked by a new stage. Windbreaks are the eighth miracle of the World (!) - a unique example when a Human interacts positively with Nature, knowing its deep, secret Laws (prof. O. Pilipenko). The system of windbreaks (total 4) and the place of laying test areas are shown at the fig. 9 and 10. Each windbreak has experimental sites. Large-scale planting of forest plantations on the marginal lands was held in October 2018 in the Zaporizhye region. Semeniv Forestry workers, regional authorities, school-forest school students, members of the association and others have been taken part in the planting (Fig. 11). According to the recommendations of the UAA, cleaning of the edges and thinning in the windbreaks LTD Company in Mankiv district Cherkasy region was carried out (Fig. 12, 13). With the assistance of the Association the Northern European Regional Meeting (NERM) has been held in Ukraine. There were 39 participants from 12 European countries: Austria, Denmark, Estonia, Georgia, Latvia, Germany, Slovakia, Slovenia, Turkey, Finland, Czech Republic and Ukraine (Fig. 14, 15).